The Japanese dragon is one of the most popular mythological creatures picked for inking and a classic choice for a tattoo design. It is usually depicted as a wingless, heavily-scaled snake-like creature with small clawed legs and a horned or antlered camel head, and is associated with sea, clouds or the heavens. 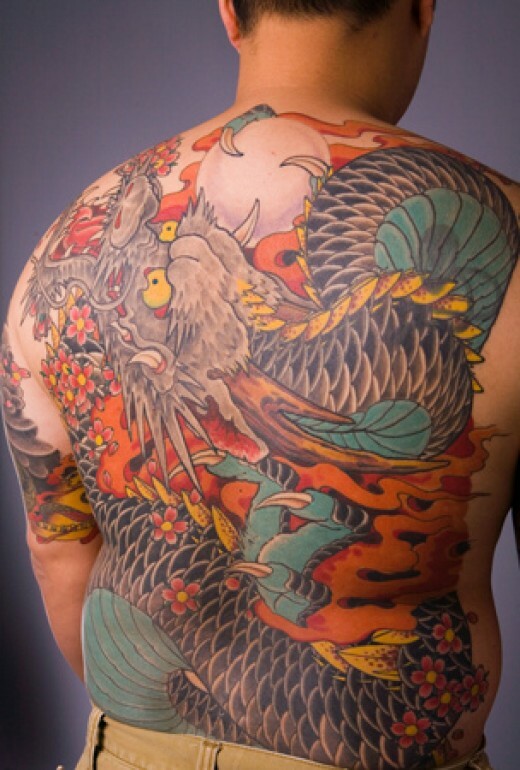 Dragon TattoosJapanese dragons tend to be much more slender and fly less frequently than the Chinese counterparts. The breath of the Japanese Dragon changes into clouds from which come either rain or fire. It is able to expand or contract its body, and in addition it has the power of transformation and invisibility. This is merely a general description and does not apply to all Japanese dragons, some of which have heads of so extraordinary a kind that they cannot be compared with anything in the animal kingdom. The popular locations for inking Japanese dragon tattoos. Japanese dragon tattoosJapanese dragon tattoos can wrap around the body and flatter the contours of the body, full body and full back dragon tattoos are quite common, and the most popular location is half sleeve, the body of the dragon wrap around the upper arm and the dragon head extend out the upper front, just above the heart. Because of the long shape of the dragon, it also suited for inking on arms and legs. After all, getting an awesome Japanese dragon tattoo that perfectly flows with your body is what makes you feel proud. Am I right? There are many good reasons to get an awesome Japanese tattoo and there are many ways to screw it up. The most important thing to find a perfect Japanese tattoo is to take your time browsing through numerous tattoo collections before you settle the one for inking.